Craving Fresh: We're getting chickens! I'm excited about today's post. It's been a long time in the making. 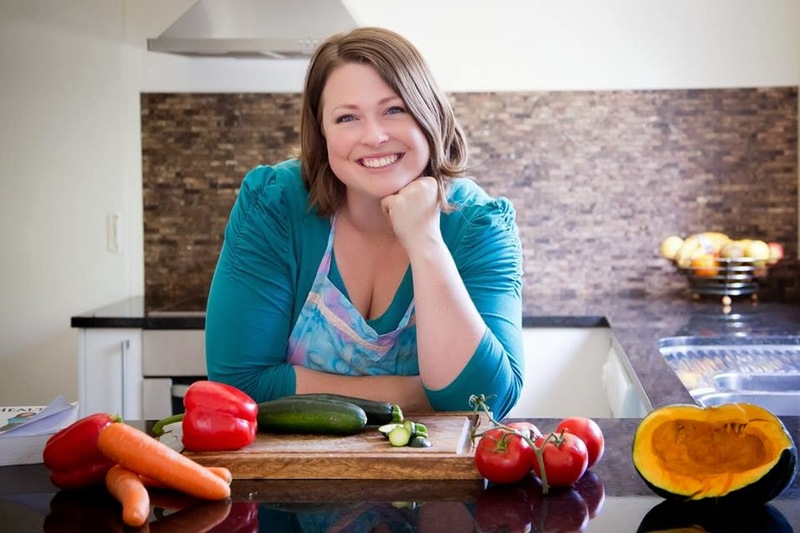 If you've been following Craving Fresh since its early days, you'll know we had chickens about ten years ago, but had to give them away because there really wasn't enough room for them in the yard we had at the time, and they were stinking up the place. 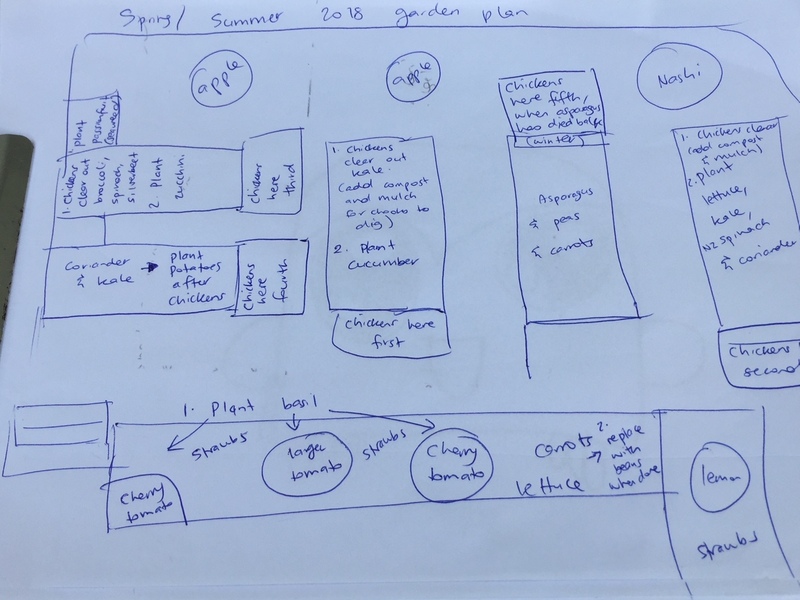 Now that we have a bit more room and I have my gardens set up the way I like them, I've reached the point where I want chickens to make my property more of a permaculture space. Chickens provide fertiliser for the gardens, they eat spent plants, weeds and scraps, and they keep the unwanted bug population down, all while providing eggs for us to eat. They are a permaculturalist's dream and I keep watching YouTube videos about people incorporating them into their homesteads in clever ways. Check out Justin Rhode's channel if you want to see what I'm talking about. So, as much as I've dreamed about getting chickens again, I didn't think it would ever happen. For one, Paul was dead set against the idea (and still is). 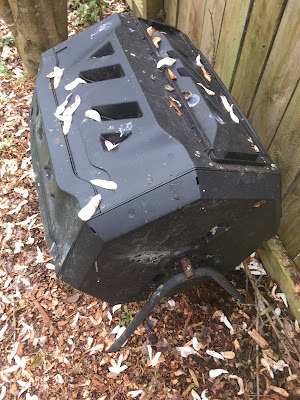 Two, I wasn't sure how to incorporate the chickens into our yard in a way that wouldn't result in all my gardens getting demolished, and everything getting covered in chicken poop. But then my really clever and kind brother-in-law, Ben, designed the perfect solution for our space. And built it. And dropped it off to us these holidays. So the decision was made for us. Happy days! I'm going to take you through Ben's design now, so you can appreciate how clever he is. 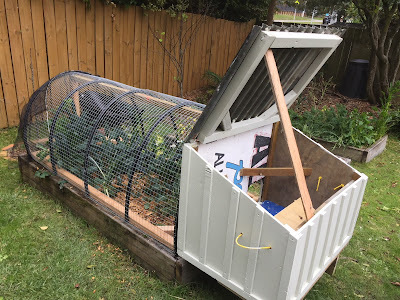 What he's built is a moveable chicken coop and run, that fits over my raised garden beds and can be moved in three parts. Ben built a platform for the coop to sit on, which clips onto the end of any of my raised garden beds. 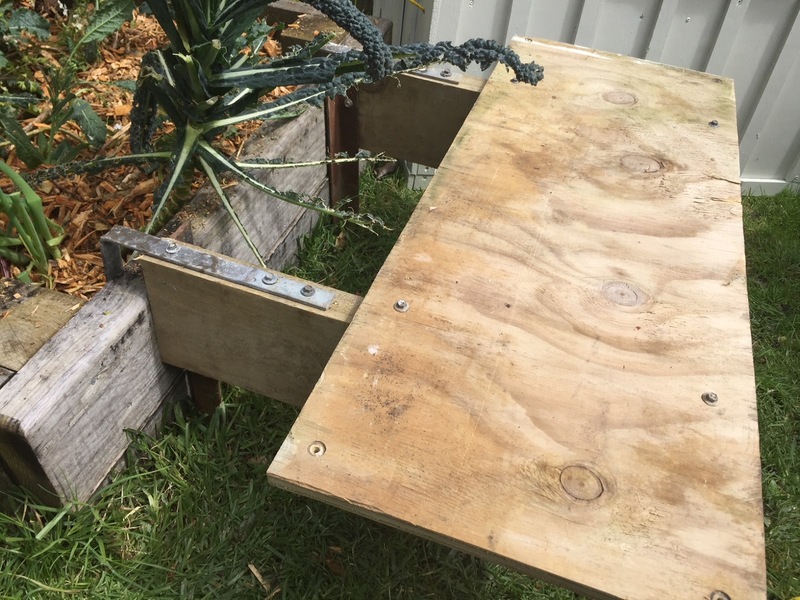 Folded metal bands hook over the edge of the garden bed and vertical metal bands dig into the ground to help support the platform from the other side. The platform allows the coop to float next to the garden bed, without taking up any space on the garden. The chicken coop sits on the platform described above, floating out from the end of the raised garden bed. It will provide a place for the chickens to sleep, lay eggs, and find shelter from the rain. We had lots of rain over the past few days, and the coop stayed nice and dry inside, so I think it will be a lovely home for the chickens. 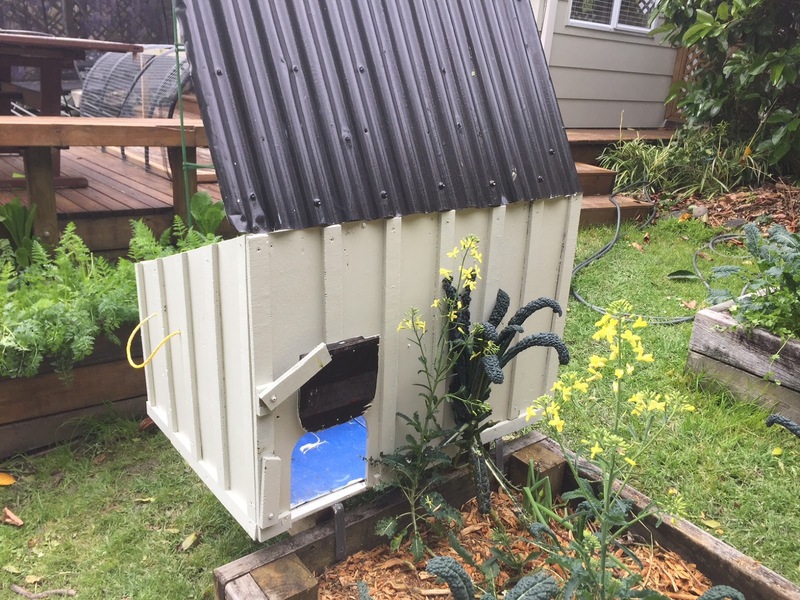 The roof of the chicken coop is hinged and can be propped open for cleaning out the coop and collecting eggs. The coop has rope handles on either side to allow me to lift and move it to other parts of the garden. The coop has two roosts built into its back corners, where the chickens can sleep at night. It also has a wooden nesting box with two compartments that Ben built for the chickens to lay their eggs in. 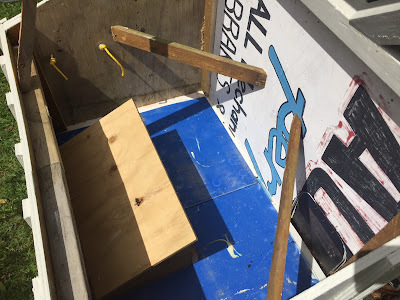 The blue sheet plastic on the bottom of the coop is removable for easy cleaning. 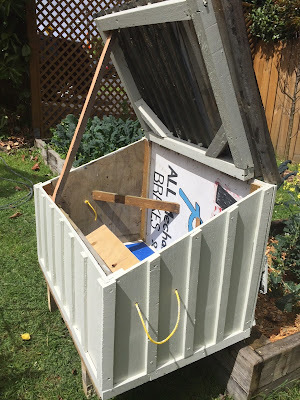 On the back of the coop is a small top-opening door, which can be hooked open or locked closed. 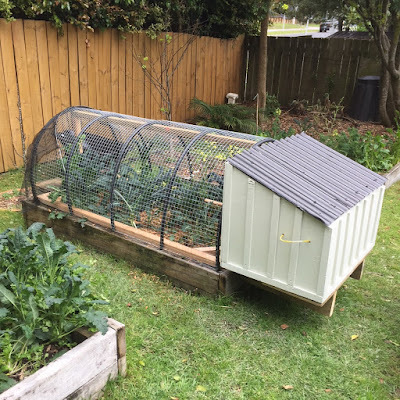 I will lock the door closed when the chickens are inside the coop and I want to move them to another garden bed. Otherwise, the door will remain latched open so the chickens can move between their coop and chicken run, which I'll show you next. 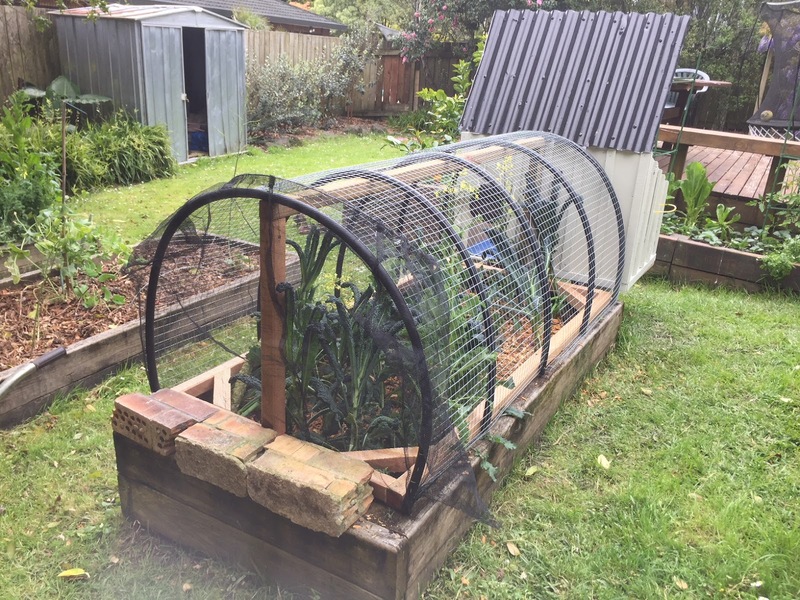 Ben built this chicken run to fit exactly over my narrowest raised garden beds. I have five raised beds in total, but two are slightly narrower and longer than the other three. When the chicken run is on one of the three shorter gardens, as above, I'll use bricks to cover the slight gap at the end, otherwise the chickens might try to escape through it. The bricks will also help keep the run in place, if we have strong winds. The open end of the run butts up directly against the back wall of the chicken coop, so the chickens can easily move between the run and their coop, without escaping. When Ben delivered the run, it wasn't covered with anything, so I got the chance to figure out how I wanted to enclose it. I chose to cover the main part of the run with square aviary wire to give the run extra stability, and then used cloche fabric to cover the exposed end of the run, so I could open that end to throw food scraps into the chooks. I used a staple gun to secure the cloche fabric to the bottom and sides of the run, after I had sewed a fold into the top of the fabric and threaded a curved cloche wire through it. 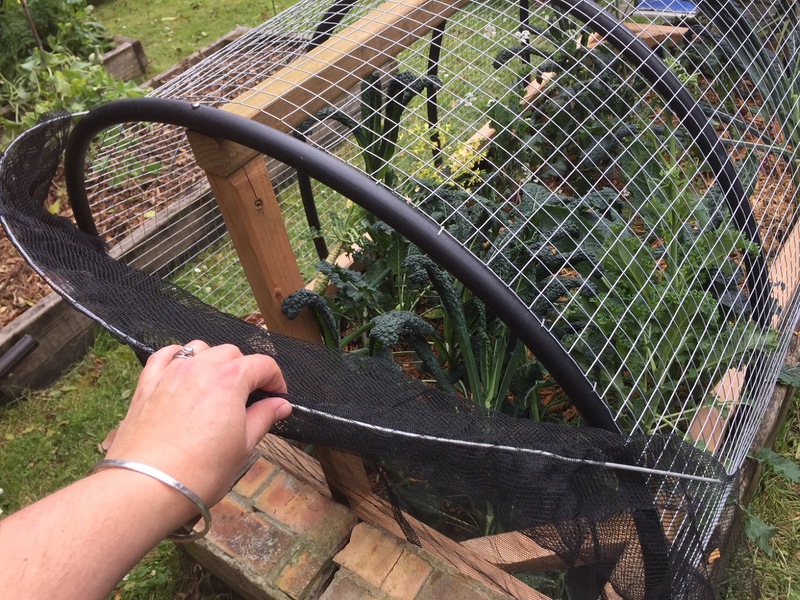 The ends of the cloche wire are longer than the fabric, so they can hook into the aviary wire on top to close the flap. It's really easy to unhook the wire to open the flap from the top, and then hook it closed again. 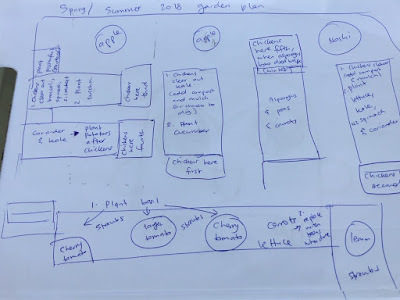 In order to be prepared for the incoming chickens, I spent a few minutes yesterday sketching out a garden plan and figuring out which order I'll rotate the chickens through my garden beds. 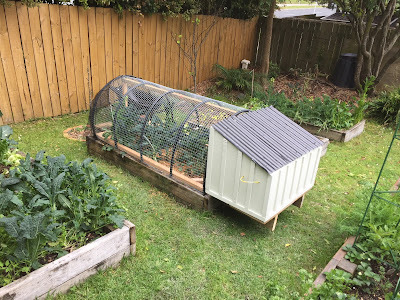 There may come a point that I don't want the chickens on any of my vegetable gardens, at which time I'll move the chickens to another area of my yard, possibly with a larger, more open run area. But we'll cross that bridge when we come to it. The first garden the chickens are going into has been growing kale for a couple of years and needs a change of crop. 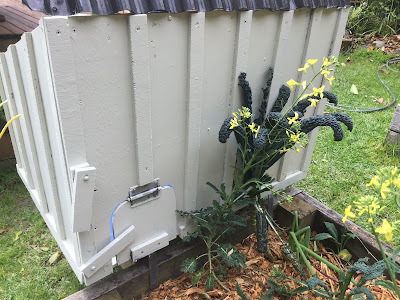 The original kale plants went to seed and more kale plants popped up from that seed, so it's been kale, kale, kale ever since. I've also got kale growing in another couple of gardens, so I won't miss this lot. The chickens will get to eat the kale that's in there, as well as any slugs, snails and white butterfly caterpillars they find. They'll also turn the soil over for me and poop into everything, fertilising it nicely. 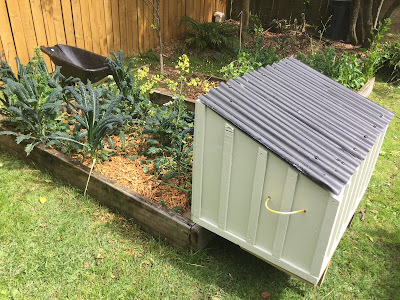 Before setting up the chicken run today, I topped up the garden it went onto with homemade compost from one half of my rotating compost barrel, and then covered that with a layer of wood mulch. The chickens should have fun scratching through the mulch, looking for worms, pooping in everything and turning it into lovely soil for my next crop. 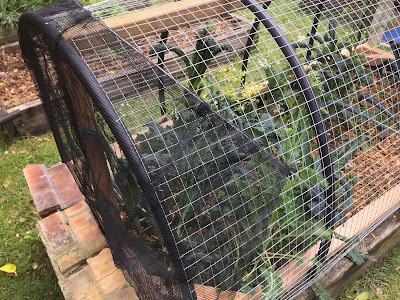 I'll try to add a few more loads of something like lawn clippings into the garden while the chickens are there, to get it nice and full before I move the chickens onto the next garden. The other item Ben built for the chickens was a chicken feeder. It's pretty ingenious. He made it out of three bits of pipe fitted together, with the ends blocked off by plywood. You remove the top section of pipe to tip the chicken food inside. The food then gravity feeds down to the bottom section which has a hole cut out of it for the chickens to peck the food. 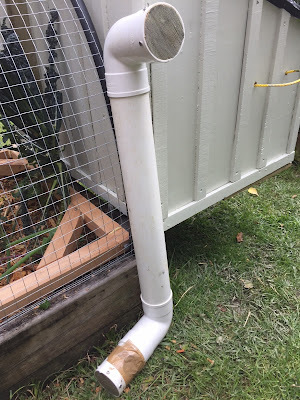 I've taped up the hole for now to keep the food fresh until the chickens arrive, but it should be a good system for keeping the chickens fed if we need to go away for a weekend. Now that we have this brilliant system all set up, we need chickens. Hopefully they'll be arriving tomorrow. We're just getting two, from friends of ours who are moving cities soon and needed to find a new home for their chooks. It will be interesting to see how this moveable system works with actual chickens in it. I think that's everything I can tell you about the chickens for now. I'll update you when the chickens are here and tell you how it's all working in practise. In the meantime, let me know if you have any questions about our chicken system. I mean, the moment I saw the title "We're getting chickens!" I was ready to click 'like'. I've wondered for a while now if you'd get them, and I think having chickens is so cool! But then you showed us your movable coop and I'm, like, oh. My. God. 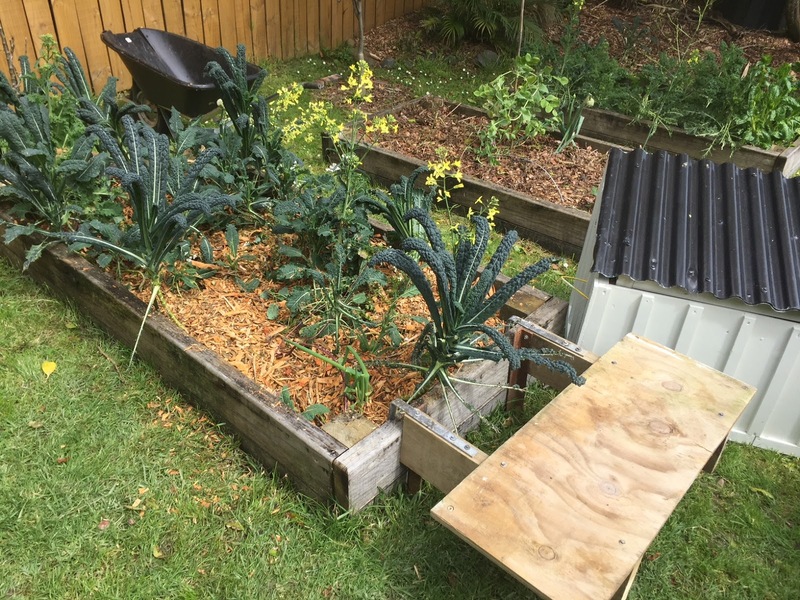 We are in the process of building raised beds. And seeing your solution (what a genius brother-in-law!) I'm thinking, wow, this looks so doable. This looks so doable! And now I'm sitting here, trying to wait patiently until my husband is finished cooking the stir-fry in the kitchen so I could show him the photos and get him excited, too. What did your husband think of the idea? I keep buzzing over how well it's working. We've got the chickens now and they seem really happy. We even got our first egg today. Woohoo!